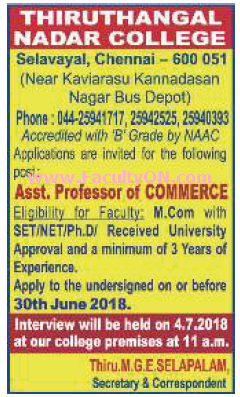 Thiruthangal Nadar College, Chennai has advertised in THE HINDU newspaper for recruitment of Assistant Professor jobs vacancies. Interested and eligible job aspirants are requested to apply on or before 30th June 2018. Check out further more details below. About College: Thiruthangal Nadar College, established in the year 1997 as a college for men was upgraded as a co-educational institution in 2002 to cater to the needs of women in North Chennai thus empowering them. It is a Self-Financing institution affiliated to the University of Madras. It was instituted by the magnanimous members of Chennaivazh Hindu Nadar Uravinmurai Dharma Fund with a deep sense of generosity and compassion to the under-privileged student community. How to Apply: Interested and eligible candidates are requested to send their CV along with copies of certificates and recent PP size photo to the postal address provided below.